Friendship is a crucial part of adolescence. Teens explore friendships to navigate their identity and their role in society. This survey finds that about half of U.S. teens (51%) see themselves as someone who tends to fit in “pretty easily” among their peers, while an almost identical share (48%) says they tend to stand out. But regardless of how they perceive their relationship with others their age, majorities of teens say they have at least one person they consider to be a close friend and keep in touch with a broader circle of friends regularly – both online and offline. Meanwhile, about six-in-ten teens have at least one close friend of a different racial or ethnic background, or who is a different gender from them. Teens also identify online groups and forums as an important part of their social lives, and as spaces where they can meet new people and receive support to cope with tough times. Fully 98% of teens say they have one or more close friends: 78% say they have between one and five close friends, while 20% have six or more close friends. Just 2% of teens say they do not have anyone they consider a close friend. Similar majorities extend across various demographic groups. However, there is some variation on this question based on household income. Teens from lower-income families (those earning less than $30,000 a year) are significantly more likely than teens in other income groups to report that they do not have any close friends (7% of lower-income teens say this, compared with 1% of teens from higher-income households). By the same token, teens from households earning more than $75,000 per year are more than twice as likely as low-income teens to say they have more than five close friends (24% vs. 11%). Teens typically point to their school as an important venue for making friends – 87% say they have a close friend from their school. Today’s teens are a part of the most racially and ethnically diverse generation in American history, and this reality is reflected in the fact that six-in-ten teens report having a close friend who is of a different racial or ethnic background than they are. A similar share of teens (61%) identify someone of a different gender as a close friend, and close to half (46%) say they have a close friend of a different religion. Despite the prominence of school as a venue for friend formation, teens’ friendships are not confined to school campuses or local neighborhoods. Around one-third (35%) of teens say they have a close friend who lives far away, while 15% say they have a close friend they first met online. In some cases, the nature of teens’ friendships varies little based on their demographic characteristics. For instance, white, black and Hispanic teens are equally likely to say they have a close friend of a different race or ethnicity. Similarly, comparable shares of boys and girls have a close friend of a different gender. But in other cases, these differences are more prominent. Most notably, white teenagers (52%) are significantly more likely than blacks (25%) to report that they have a close friend with a different religious background. And mixed-gender friendships are more common among older teens: 67% of teens ages 15 to 17 have a close friend of a different gender, compared with 52% of teens ages 13 to 14. This survey explored the way teens interact with their friends apart from school activities or those directly related to school. Sizable majorities of teens spend at least one day per week with their friends online (88%) or in person (77%). But when it comes to daily interactions with their friends, teens are much more likely to report that those interactions take place online. 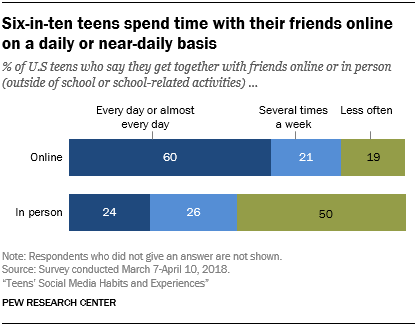 Six-in-ten teens say they spend time with their friends online every day or almost every day, compared with 24% who spend time with their friends in person with the same frequency (not including school or school-related activities). Despite the relative infrequency of their in-person interactions with friends, a majority of teens (57%) say they spend about the right amount of time with their friends face-to-face. But roughly one-third of teens (36%) think they have too little face-to-face time with their friends. A small share (just 7%) believe they spend too much time seeing their friends in real life. The largest shares of teens in a variety of demographic groups indicate they spend about the right amount of time with their friends in person. Nonetheless, many teens who see their friends on a less-than-daily basis express a desire for more time together in person. Just 17% of teens who get together with friends on a daily basis say they spend too little time together – but that share rises to 42% among teens who get together with friends less often. Some critics have argued that the internet and social media are to blame for teens’ diminishing real-life interactions with others. But teens themselves point to a variety of reasons for why they do not spend more time with their friends in person. 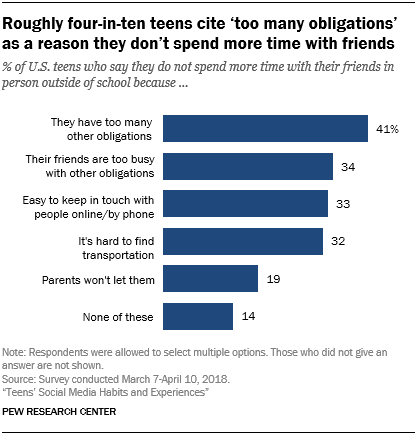 The most common of these (cited by 41% of teens) is that teens themselves report they simply have too many other obligations to find time to hang out with friends. Meanwhile, 34% say their friends are too busy with their own obligations to find the time for friend activities, and 32% say the difficulty of finding transportation prevents them from seeing their friends more often. Still, the ease of digital communication ranks among the top reasons given by teens when asked why they do not spend more time with their friends in person – 33% of teens note that it is simply easier to connect with a friend online than to attempt connecting with them physically. Hispanic teens are especially likely to say that several of these factors prevent them from seeing friends in person as much as they would like. While 46% of Hispanic teens say the ease of talking to their friends online or on their phone is a factor in not seeing their friends more often, just 30% of whites cite the same reason.3 Hispanic teens are also more likely than white teens to cite parental intervention as a barrier to seeing their friends in person (25% vs. 13%). By contrast, white teens are more likely than black teens to say that their friends’ busy schedules are a major factor preventing them from seeing friends more often (37% vs. 20%) and are more likely than Hispanics to point to transportation challenges as an issue (36% vs. 16%). Online groups and forums allow teens and adults alike to interact with a broad pool of people who share common traits, interests and experiences. Teens and young adults in particular have access to a wide range of age-specific online forums where they can seek out health-related information, discuss political and social issues, play games with their friends or have a safe haven to explore their identity. This survey finds that around half of teens either often (12%) or sometimes (34%) spend time in online groups or forums, with another 31% indicating they rarely take part in these groups. Different demographic groups take part in online communities at different rates. For example, a larger share of Hispanic teens (86%) than white (76%) or black (69%) teens say they have ever visited online groups or forums. And although boys and girls are equally likely to ever join an online group, boys are twice as likely as girls to say they often spend time in these groups (15% vs. 8%). Certain types of online groups are particularly popular among teens today. About four-in-ten teens (41%) report participating in online groups that center around hobbies such as gaming, and a similar share (40%) participates in groups with a focus on humor. Around one-quarter of teens say they spend time in groups talking about pop culture, sports or fashion. More modest shares – around one-in-ten – report being involved in online groups that focus on identity, politics or religion. Participation in different types of online groups varies by gender; certain types of online groups are more appealing to boys than girls, and vice versa. 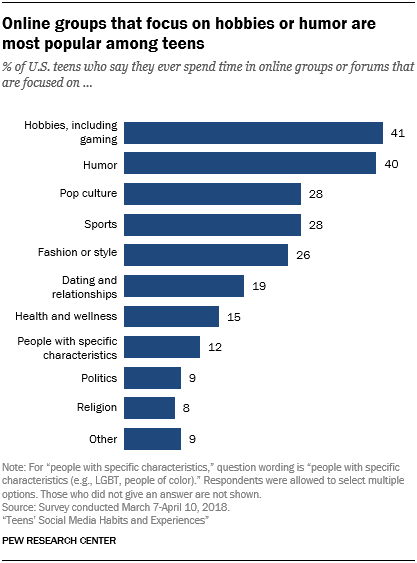 Boys are roughly twice as likely as girls to visit online groups centered around hobbies, including gaming or sports, whereas girls are more likely than boys to visit online groups about fashion and health and wellness, as well as groups oriented toward people with specific characteristics (such as LGBT or people of color). At the same time, online groups that focus on humor and pop culture draw similar interests from boys and girls. Teens who are part of an online group tend to have positive attitudes about their experiences in these groups. Roughly three-quarters of online group participants (74%) say these groups play a role in exposing them to new types of people, including 31% who say online groups play a major role in this regard. Apart from meeting new people, majorities of teens who belong to an online group say these communities play a role in making them feel more accepted (68%), helping them figure out how to feel about important issues (65%) or helping them get through tough times in their life (55%). Online group participants who are black are more likely than white participants to say these groups play a major role in introducing them to new people (46% vs. 28%). Meanwhile, online communities are particularly beneficial in helping certain populations get through tough times. For example, 24% of girls who belong to an online group say it plays a major role in this regard, compared with 14% of boy participants. Similarly, lower-income teens who visit online communities are around twice as likely as teens from higher-income families to say online groups play a major role in helping them through tough times (25% vs. 12%).